Alan gives tips about Vancouver. Todd: Um, hey, Alan, so I want to go to Vancouver, and I'm really excited about going. I don't know anything about the city. Can you give me some advice or tips on things I should see or do? Alan: Yeah, sure Todd. I'd be happy to. There are a lot of things to do in Vancouver, especially in the summertime. I would recommend first you go to Stanley Park. It's one of the largerst and most scenic city parks in the world. There's a sea wall around the park that you could jog, go for a walk, and beaches. It's one of, it's high on the list of tourist attractions of Vancouver.Secondy I would reccommend you take a gondola up Grouse Mountain. From Grouse Mountain you can see the whole or mainland. It's a very good view from there, and there's a nice restaurant and gift shops up there and there's hiking trails and so on, mountain biking trails you can go on, in the summertime, of course in the winter, it's a ski area. Todd: Ah, sounds good. Hey, what about all the islands? Can I take a ferry to one of the islands? Alan: Yeah, you can take a ferry from Vancouver to Victoria located on Vacouver Island. It's about an hour an 35 minutes and in Victoria there's sights like the legislative buildings, because victoria is the provincial capitol. It has the legislative buildings, goverment buildings. Buchart Gardens which are world famous flower gardens, and of course if you drive out of Victoria on the highway up north you can see many small towns and places on vancouver island. Todd: Now to get around the city should I rent a car or should I just use public transportation? Alan: Well, it depends on where you want to go. 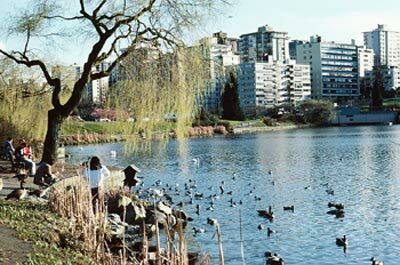 I would, for the close sights, things like Stanley Park, even Grouse Mountain, the Canada Place, another attraction in downtown Vancouver, any of those close attractions you could use public transport. If you want to go out of Vancouver a little bit, maybe to the islands, or maybe you want to drive up to Whistler, which is only two hours away, I would recommend you rent a car, for the longer distances. Todd: OK, well, sounds good, man, I'm really excited about my trip. It's one of the largest and most scenic city parks in the world. Although it was a longer trip, he preferred to take the smaller roads because it was more scenic. The house has a beautiful scenic view of the lake. There's a sea wall around the park. The storm was so powerful that the waves almost reached the top of the sea wall. After the hurricane, they decided to make the sea wall near the city a little taller. I would recommend you take a gondola up Grouse Mountain. The best view of the mountain was from the gondola. When the gondola stopped on the way up the mountain, I realized that the air was very cold. Can I take a ferry to one of the islands? The ferry moved so slowly that I thought we would never arrive at the island. Taking the ferry across the river was much easier and faster than driving across the bridge with all that traffic. In Victoria there's sights like the legislative buildings. The legislative system has always been interesting to me. I hired a lawyer because I didn't understand all the legislative documents. I will meet you on the pier where the drops you off. All of these photographs were taken when we were in the going up the mountain. After the storm last year, there are many areas of the that need to be repaired. He is always informed about the latest decisions. It's a long drive, but it's very and beautiful this time of year.